Thomas Worsey (1829-1875) was a Birmingham flower painter whose fine art education was extremely unusual. He began his formal art training in the art of 'Japoneserie'. As a 'Japanner', he used paint and paper-mache as his medium. Worsey was well-known as a Japanner, however, as time progressed he was drawn towards Victorian Still-life painting. These two artistic movements sought very different objectives. While the Japanners preserved and revived the ancient eastern decorative arts, the Victorians strove to cleanse themselves of false art teachings and then develop a more realistic style. The influences of both the Japanners and Victorians are evident in his work. It is not suprising that Worsey turned toward Victorian still-life painting as it was the dominant movement in Britain during the time he flourished. Worsey was a loyal patriot and citizen of Birmingham, where he was born in 1829 and remained until his death in 1875. By 1850, he had already established his reputation in Birmingham and throughout Britain as a brilliant Victorian still-life artist. Worsey Exhibited from 1856-1874, at several major art shows and associations. Specifically, he exhibited at the: Royal Academy from 1858-74; British Institution from 1858-1867, Suffolk Street, Portland Gallery and throughout the principal provincial towns. Worsey's paintings were appreciated by the art patrons and critics alike. His work was reviewed often and appreciated for its realistic execution and highly aesthetic qualities. 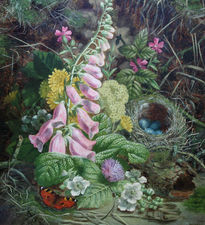 Worsey's painting entitled Primulas, exhibited at the Portland Gallery, was discussed in the Art Journal and they stated: "These flowers are painted with much freshness and delicacy". His painting Apple Blossoms, exhibited at Suffolk Street, was praised for its realism.